Reckless driving is a criminal offense in Virginia, and you may need to attend one or more court hearings if charged with this offense. When you signed your ticket, which was a summons to appear in court, you promised to attend all court hearings. There are generally two court hearings in these cases: arraignment and trial. Understanding what happens at them can help eliminate some of the fear you may be experiencing and help you to be better prepared. An arraignment is an initial hearing held in many cases where there is a possibility of a jail sentence. In Virginia, reckless driving is a Class 1 misdemeanor with a possible sentence of 12 months in jail and a fine of up to $2,500, in addition to a license suspension for up to 6 months. Not all reckless driving cases are scheduled for an arraignment. You will need to look at your ticket to see if your first hearing is an arraignment or trial. As a general rule, if your hearing is within a few weeks of the date you were charged, it is probably an arraignment. If it is scheduled later out, it may be your trial date. You can also contact the court clerk for the court where your hearing will be held to find out what type of hearing is scheduled. The best way to find out and protect your legal rights is to retain an experienced reckless driving attorney who can attend your arraignment with you or waive the arraignment and have the case set for trial. Charges. The judge will read the charges against you and be certain that you understand them. Appointment of an attorney. Because a conviction carries the possibility of a jail sentence, you have the right to be represented by an attorney. After reading the charges, the judge will ask you if you intend to retain an attorney and inform you of your options. These are to retain a lawyer at your own expense, waive your right to an attorney, or ask the court to appoint one because you cannot afford to hire one. If you are requesting a court-appointed lawyer, the judge will ask you questions regarding your employment and your financial situation to determine if you qualify as “indigent.” If so, he will appoint an attorney to represent you. Next court hearing. If you waive your right to an attorney—never a good idea—you may have your trial on that date. Otherwise, the judge will schedule your next court hearing, which will be your trial. Your trial in your reckless driving case will be held in the General District Court, or the Juvenile & Domestic Relations Court if you are a minor. If you retain an attorney to represent you, your attorney will speak with the officer and the prosecutor on your behalf. This can include obtaining a plea to a reduced charge, such as speeding or improper driving, or an agreement on sentencing, depending on the circumstances of your case. This negotiation is critical because it can reduce your charge from a criminal misdemeanor to a traffic infraction, in addition to potentially reducing the number of demerit points assigned by the Department of Motor Vehicles as a result of your moving violation. If your case is not resolved by a negotiated agreement, your case will be decided by a judge. 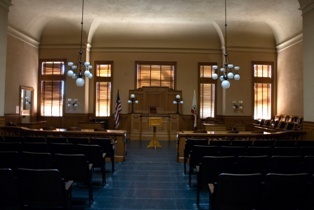 You do not have the right to a jury trial in a District Court reckless driving case, although you do have a right to request a jury in the Circuit Court if you appeal a conviction from the District Court. The prosecutor, who is also referred to as the Commonwealth’s Attorney, will probably attend your court hearing. However, in some rural jurisdictions, the ticketing officer may be the only one appearing at your trial. No contest, which is not admitting guilt but not contesting the evidence against you. This has the same effect as a guilty plea. If you are pleading guilty, you will be sentenced at this hearing. Your attorney may have entered into a plea agreement with the prosecutor. Arguments. The prosecutor and your lawyer may give a short statement at the beginning and end of the trial. Police officer’s testimony. The Commonwealth would present their witnesses and evidence first. The police officer will most likely testify. Your attorney will have the opportunity to cross-examine the officer and challenge any other evidence against you. Your witnesses. Once the prosecutor presents his witnesses, your attorney can call witnesses, such as eyewitnesses or expert witnesses, and present any other evidence on your behalf. The Commonwealth’s Attorney has the opportunity to cross-examine your witnesses. Your testimony. You cannot be required to testify in your case, which is part of your right not to incriminate yourself under the Fifth Amendment. If you do testify, you can expect the prosecutor to question you. Decision and sentence. At the end of the trial, the judge will make a decision on whether you are guilty or not guilty. If trial results in a conviction, you will also be sentenced. There may be additional arguments by the prosecutor and your attorney before the sentence is imposed. Depending on the jurisdiction where your case is being heard, your attorney may be able to attend your arraignment and trial on your behalf without you needing to be present. However, you should never assume that without first confirming it with your attorney. If you were charged with reckless driving in Fairfax or Northern Virginia, our experienced reckless driving attorneys can explain your options to you, mount a strong defense to the charges you face, and attend your hearings on your behalf. Call our office or fill out our convenient online form to schedule your free consultation today.